A journalist, a graduate of the University of Warsaw and 3rd-cycle studies at the Institut national des langues et civilisations orientales in Paris. 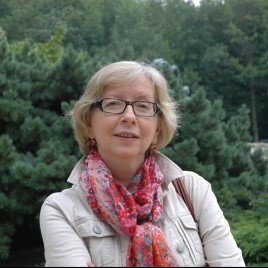 She has written the following books: Ukraiński palimpsest – Oksana Zabużko w rozmowie z Izą Chruślińską, [The Ukrainian palimpsest - Oksana Zabuzhko in an interview to Iza Chruślińska; 2013 – Polish issue, 2014 – Ukrainian issue], Ukraina. Przewodnik Krytyki Politycznej [Ukraine. The Guide to Political Culture, 2009], Była raz Kultura. Rozmowy z Zofią Hertz [There was a Culture. Interviews with Zofia Hertz; 1994, 2003] and a co-author (with Piotr Tyma) of volumes Wiele twarzy Ukrainy [Many Faces of Ukraine, 2005] and Diałohy porozuminnia. Ukrajinśko-jewrejśky wzajemyny (Kyiv 2011). Currently she is preparing a book with an extended interview with Yosif Zisels for the Duch i Litera publishing house from Kyiv.